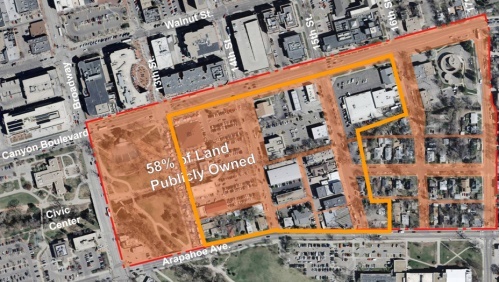 Fifty-eight percent of the land in SoDA (South of Downtown Area between 13th and 16th Streets and Canyon and Arapahoe) is publicly owned, and, if that space is used imaginatively, the redevelopment of the private land in SoDA will almost inevitably succeed in benefiting the public, asserted Sam Assefa, senior urban designer, and Louise Grauer, senior planner, for the City of Boulder at a PLAN-Boulder County forum on Friday, September 17. Assefa observed that SoDA is already sharply defined by Canyon Boulevard on the north and by the nearly parallel North Boulder and Farmers’ Ditch about half a block to the south. He remarked that the irrigation ditch is now largely neglected as a source of amenities, and proposed at least one public, green space along it on each block. He also noted that the public right of way for Canyon Boulevard is 78 feet from each side of the centerline and that it is currently not being fully used on the south side of the thoroughfare. The plan proposed for SoDA by the City’s Planning Department provides for widening Canyon to eight lanes with rows of trees between the lanes. Four of the lanes would be for through vehicular traffic, two would be for bicycles and pedestrians, and two would be for on-street parking. 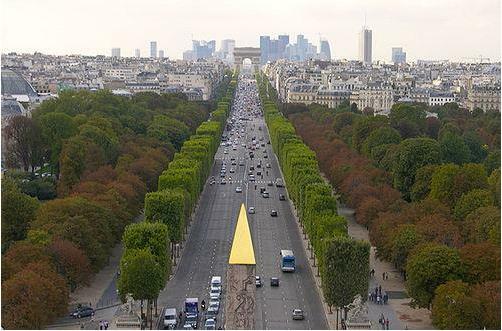 The effect, Assefa claimed, would be to create a lively, public space, perhaps somewhat similar to the Avenue des Champs-Elysees in Paris, that would invite pedestrian activity, attract outdoor cafes, and mitigate the “dead zone” that many believe exists on the north side of Canyon. This plan was presented to the Planning Board this past spring and to the City Council at a study session on August 24. Grauer said that the Planning Department will submit a summary of the study session to the City Council on October 5 and suggest directions from Council for further work. One of the directions which she indicated was likely to be suggested to the Council is an inter-departmental study of the area bordering Canyon Boulevard from 9th Street to 17th Street by City staff during the next year with a view to widening it to fill the full 156 foot right-of-way. Grauer and Assefa said that the existing zoning in SoDA allows for a Floor to Area Ratio (“FAR”) of 2.7. The Planning Department recommended to City Council lowering the FAR in SoDA to 2.0. Grauer commented that the Council seemed content with the existing 2.7 FAR. Both Assefa and Grauer claimed that the difference between the effects of 2.0, 2.2, and 2.7 FAR on the attractiveness of SoDA would be marginal, if the public spaces are created wisely. Assefa noted that the average density on the north side of Canyon between 16th and 10th Streets is 2.15, even though current zoning allows for a higher FAR. The Planning Department also recommended that the by-right height limit in the downtown area, except for the historic district, be expanded from 35 feet to 38 feet. That limit would accommodate a 14 foot high first floor at street level and second and third stories of 12 feet each in height. Assefa and Grauer maintained that 14-foot high floors are considered standard for retail use. Grauer added that the Planning Department has further proposed 1) a 15 foot setback for fourth stories, 2) requiring permanently affordable housing in all developments receiving a density bonus, and 3) eliminating the below-grade habitable floor area in the overall FAR calculation. Assefa acknowledged that threading bus traffic to and from the RTD station at 14th and Canyon and on-street collection areas between eight lanes on Canyon could be tricky. Audience member Al Gunter also asserted that redevelopment in downtown Boulder to the currently allowable density will cause traffic gridlock. A plan for SoDA, if adopted by the City Council, would be implemented slowly over several decades as properties redevelop. Some in the audience expressed concern that such a plan must be devised so that it would withstand efforts to distort it over time. The Planning Department’s study of SoDA was precipitated by the City Council’s rejection in 2009 of a proposal to redevelop the Robb’s Music property at 1580 Canyon. At the forum one of the redevelopers of the Robb’s Music property asserted that the main effect of the proposed SoDA plan would be to shift a new building on the property 15 feet further from the centerline of Canyon. Blue Line Poll: How Big is Too Big? Beware of high density spreading across downtown … And another developer paying off the city to build high end, UNaffordable housing/ buildings 4 stories + high. I thought south of Canyon was hands off? I live downtown, and the density doesn’t bother me. That road cross section looks atrocious though. *8* lanes for cars, and maybe the equivalent of 2-3 for humans, right downtown? It looks almost identical to the 120′ wide “boulevard” that they put forward for Pearl east of 30th. It would be a huge barrier to people moving between downtown and south of downtown. It would be nice if instead of only having the subsidized affordable housing, there were intrinsically affordable units… i.e. small ones with no mandatory $30,000 parking space. 1BR/2BA 1,500 sq ft.